This April 2012 photo shows Rabbi Eckstein at a Passover food pantry event in Lod, Israel. African-American evangelical leaders visited a Jerusalem crafts workshop for elderly Israelis, a project supported by the International Fellowship of Christians and Jews. 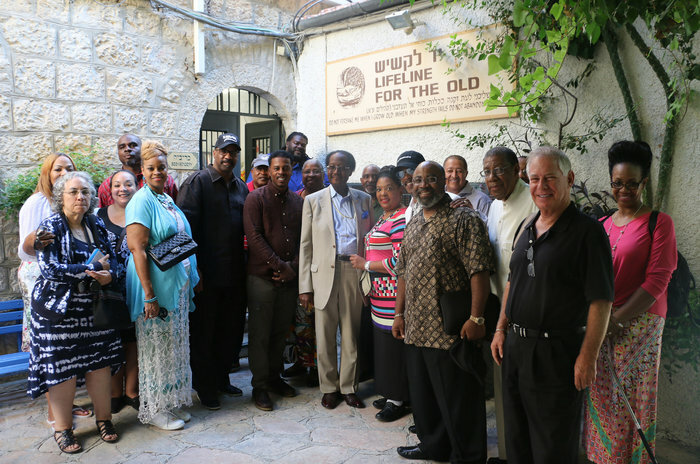 The group and Israel's tourism ministry sponsored the pastors' trip to Israel, part of the Fellowship's new outreach effort to African-American congregations. Bishop Edwin Bass first set foot in the Holy Land last month, though he&apos;d sung songs and preached stories of Zion much of his life. Head of the Church of God in Christ&apos;s Urban Initiatives program, which assists the Church&apos;s 12,000 congregations across the U.S. combat social problems, he called his week-long sojourn one of the most moving experiences of his life. "Just to have come and walked in the city of Jerusalem, to put the pieces together and understand the history of it, it&apos;s been a great experience." Bass was part of a 20-member delegation representing the 6.5 million-member Pentecostal church. The visit was paid for by the International Fellowship of Christians and Jews, a charity supporting dozens of social projects in Israel and the Jewish diaspora, as well as Israel&apos;s tourism ministry. It was part of a new outreach effort to African-American churches by the interfaith group, which has offices in Jerusalem, Chicago, Toronto, and Seoul. 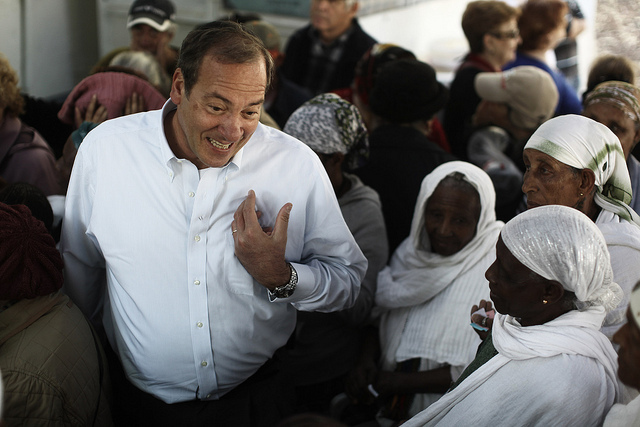 Fellowship founder Rabbi Yechiel Eckstein welcomed the visitors to a center in Tel Aviv that assists migrants seeking asylum in Israel, mostly from Sudan and Eritrea. "Shalom," he said, using the Hebrew greeting of peace, then joked, "Are you all new immigrants here?" Eckstein&apos;s organization raises more than $100 million a year. He built the charity over years of reaching out for financial contributions from mostly white American evangelical Christians. Last year, the fellowship began approaching specifically African-American congregations. Like white evangelicals who have become ardent backers of Israel, members of the Church of God in Christ adhere to a theology that supports the country as the manifestation of a promise from God. But Eckstein says his outreach efforts ran into political differences. "The land is the Jewish people&apos;s, we have a covenant, all that is there," says Rabbi Eckstein. "But they&apos;re also African-American and Democrats, and in a very difficult position to go against the president." He means President Obama, and he&apos;s talking specifically about Obama&apos;s work to negotiate the deal with Iran that is designed to curb its nuclear program in exchange for lifting sanctions. Calling Iran an existential threat to Israel, Eckstein actively lobbied against the deal. So did Israeli Prime Minister Benjamin Netanyahu, deepening a rift with the Obama administration. Kristina King, director of the fellowship&apos;s new outreach efforts, says many Obama supporters saw Netanyahu&apos;s behavior as disrespectful or even racist. King is African-American and previously worked for the pro-Israel lobby, AIPAC. "Safety and security is the issue with the Jewish community," she says. "Respect is the issue with the African-American community. So when you disrespect our president, it&apos;s a hard offense to overcome." 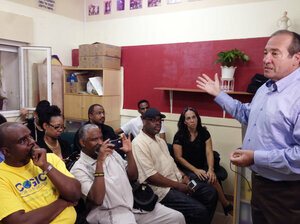 Several pastors on the trip agreed, but preferred to talk ministry over politics. Bishop P.A. Brooks, global vice president for the Church of God in Christ, said he believes Obama is "completely dedicated" to the safety of Israel. Bishop Bass, who represents the church with the White House, called the Iran issue "too sensitive" to comment on. Rabbi Eckstein believes the tensions over the Iran treaty will blow over soon. When it comes to a relationship with the African-American community, he is thinking long term. "Here are potential allies," he says. "Maybe we won&apos;t push them on that, but we will certainly soften them to overtures by others and build that support and solidarity for Israel." So the schedule put together for the church group&apos;s recent visit included a stop at a Tel Aviv bomb shelter, as well as visits to historic religious places such as the Sea of Galilee, where Jesus preached, and the Western Wall, the holiest site in Judaism. The visiting pastors handed out backpacks for children at the Tel Aviv migrant assistance center and met with Jewish Ethiopians, a group Israel has struggled to integrate. Earlier this year, allegations of racist police behavior in Israel exploded into violence. Bishop Brooks says he&apos;d like to help Israel with racial integration. "I feel we can assist in that area, in funding," he says. "And we could, in a consultative way, advise how best to handle these types of situations and not be in denial." Highlighting such opportunities may be the right approach for the Israeli charity to build allies among African-Americans, says John H. Bracey, Jr., chair of Afro-American studies at the University of Massachusetts Amherst. "Getting money for some other black people is different from giving money to Israel," he says. "This is more pan-Africanism than pro-Israeli sentiment. And it&apos;s an acknowledgment of racism in Israel." That potentially raises the issue of Palestinians, says Valerie C. Cooper, associate professor of black church studies at Duke University. The ministers&apos; trip took place shortly after 1,000 black activists publicized their support for Palestinians. Cooper says African-Americans have a history of common cause with Jews from civil rights struggles, but views on Israel have diverged since then. "Black and white evangelicals share an almost mythic understanding of Israel and a very unqualified support of Israel," she says. "On the more progressive side, among African-Americans in particular, there are those who see the Palestinian struggle as racialized." She says there is potential overlap between the interests of Israel and African-American church congregations. "This is an untapped field," she says. "But I also think that there may be limits to how successful lobbying efforts will be." If they are successful, says Josh Reinstein, director of the Christian Allies Caucus in Israel&apos;s parliament, vocal African-American backing for Israel could shore up Democratic support for Israel after the divisive vote on the Iran accord. He calls the record of Congressional Democrats "just as pro-Israel" as that of Republicans. But he worries that could shift. "There&apos;s threats and there&apos;s cracks in the community that are saying maybe some part, or the left flank of the Democrats, will start taking on the Palestinian narrative, and not the pro-Israel position they have until now," Reinstein says. The Church of God in Christ leaders did not meet with Palestinians on their recent visit. They didn&apos;t go to Bethlehem, Jesus&apos;s birthplace, which is in Palestinian territory — separated from Jerusalem by a military checkpoint and tall concrete wall. Bishop Brooks, the church&apos;s senior figure on the visit, said the delegation was primarily concerned with the strength of Israel. "That&apos;s not to say the Palestinian issue is not deserving of consideration as well," he said. "Anything that helps humanity."